The title is a bit of a misnomer, but I promise that there is pig in this story. And ice cream. 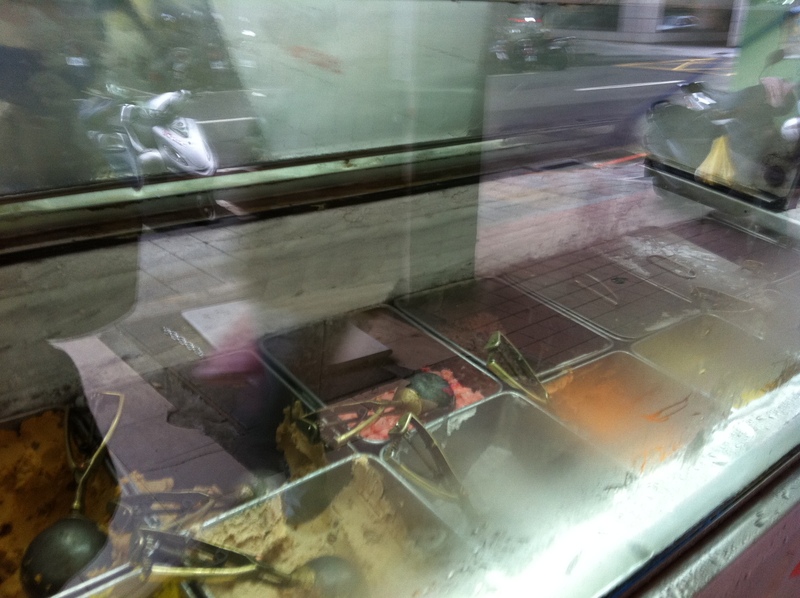 Taiwan can be hot and steamy, so what could be more refreshing than cold, cool, refreshing ice cream? At Snow King, they offer just that. If you look at the rather bad photo, you can see a whole range of flavours – and what flavours! Sesame oil chicken, beef, pig knuckle — not exactly the flavors to expect at an ice cream shop, let alone one that’s been in business since 1947. 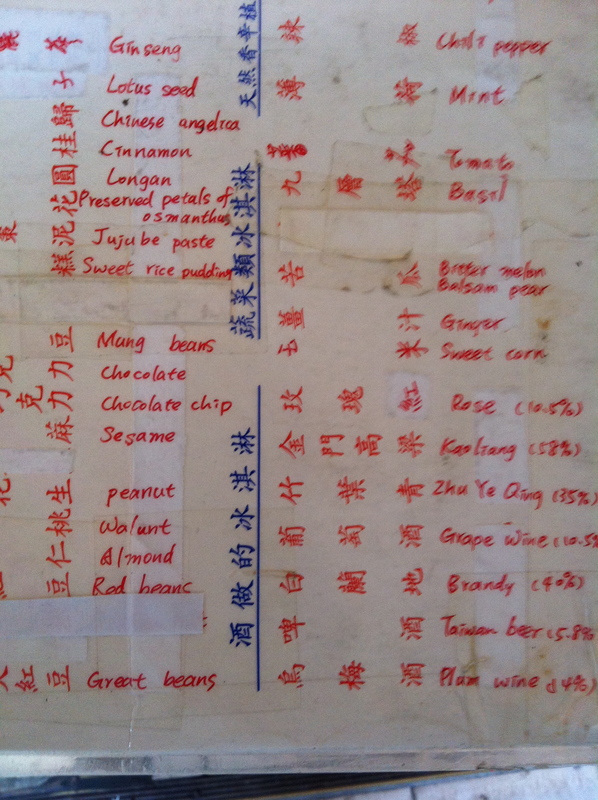 Yet these are a few of the long-standing choices on the menu at Snow King, located near Zhongshan Hall in Ximending. The shop serves more than 70 flavours of fresh homemade ice cream (priced between NT$60 and NT$120 per scoop), which range from the classic to the bizarre. The regulars come for the house specialties, red bean and watermelon, while the tourists, mainly from Japan and Hong Kong, often go for the exotic flavours: the Japanese prefer lychee and peach; Hong Kongers like curry and wasabi. The unusual flavors are a source of pride for Snow King. All of the shop’s recipes, now a family secret, were conceived by the founder, grandfather, Kao Jih-hsing, who founded the business on savings from selling ice cream on the streets of Taipei. If you’re interested in trying many flavors at once, bring a group of friends. Each flavour of ice cream is sold only by the scoop. However, while it’s fairly common to see groups order as many strange items as they can and share them, shop proprietor Kao Ching-feng says that, ideally, each ice cream should be savored individually for its pure taste. How to get there: Snow King is near the corner of Wuchang Street (武昌街) and Yanping South Road (延平南路). If traveling by MRT, get off at Ximen MRT Station (西門捷運站), Exit 5, walk north, and turn right on Wuchang Street.